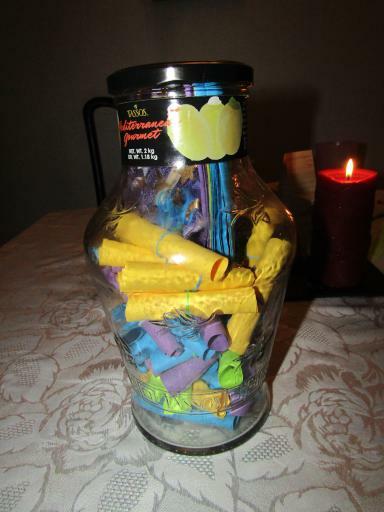 New Years mean resolution making, this is what we have done this year – it is a resolutions and goal setting jar. Divide the A4 sheets into 8 rectangles each, this can be done by either measuring or folding each piece in half three times. The write the resolutions or goals onto the small rectangles, you can include action plans or tick lists if you wish. Then roll up the small piece of paper and secure with loom band and place in jar. If there is space left in the jar put spare rectangles in there with small pencils and bands contained in a small bag so that people can continue adding goals through out the year. Leave in prominent place so that you do not forget your goals, and take our for review on a regular bases. For those who don’t want others to read their goals stickers can be used as seals instead of bands and “do not read” can be added to the finished scrolls. I sat down to take part in the next Time Capsule for Art Evolved – an on line paleo-art community (ie people who draw dinosaurs etc) – the next capsule is basically elephants, so mammoths and mastodons etc… I sat down to draw one but with christmas music and decorations around I found that I couldn’t get rid of a specific image… a mammoth in a Santa’s hat. So I drew her! Ever Hopeful Helgar may just get her Christmas wish is the tag line. Anyway I suppose I should get one with drawing a non-christmas one The drawing was done by sketching an outline in pencil and then inking it in using Stabilo fine liners. I have quiet a few coulors now – though still not quiet enough! After Christmas and birthdays and the like my husbands family expect Thankyou Cards – this was a new one on me as in my family you just say thanks to each other. None the less I struck on a good way of making thankyou notes and occupying a small child at the same time. First off I got some sugar paper/mounting card and some poster paints and just got Jean to paint on one side of the card – I went for red and green card as these where Christmas thankyous. This worked best as a hand squishing and swerling paint excersise so was extrememly messy. Once dry I cut out the thankyous we’d written on plain white paper – they could have been printed but I like hand writing notes. I then cut them out and using little loops of cellotape stuck them to the card on the none decorated side. I then used a paper gliotine to cut out the card as a boarder to the letters. This was suprisingly effective – especially as I made sure they would all fit into the various sizes of envalopes we have! I think this would have worked better with double sided tape and perhapse the more uniform sizing of printing the letters. This snowman bag was made by my little girl when she was I think one and it was done at her nursery – its one long bit of thickish paper, with a very fiberous feel too it in pink. They then with Jean’s help stenciled a snow man in white – Jean obviously added a purple streak! Then the sheet was folded in half and the sides taped to make a bag. Metalic pink parcel ribbon was then stapled on for handles – this contianed all the presants she had made Mummy and Daddy. It’s a lovely simple idea and perfect for younger children! I made this border by folding a piece of slightly bigger than A4 card in four to make the greetings card. I then took a foam holly stamp foam stamp from a set I found in the pound shop and pressed it into an ink pad of the more yellowy green I have. Because of the red of the card I needed to make sure the stamp was well covered in ink and then only stamp on holly leaf at a time – this was to get a more solid green and not dingy looking leaf. I created the border pattern on quiet a few cards as it then allowed me to personalise the cards with glitter pens and the like for each person who was going to receive one! For this vase I used one glass tumbler (Tesco’s value glasses survive baking. I always do a test run to check, before I spend ages decorating a glass), a pen knife, rolling board (marble or glass is best but I use an old chopping board with greaseproof paper over it), a hi-ball glass (this is instead of a glass rolling pin as polymer clays, of which fimo is one, melt certain plastics and get stuck in the grain of wooden rolling pins), one metal Christmas tree cookie cutter (I have specific cutters for the polymer clay work as it is not advisable to re-use for food), one baking tray and one oven. Dark green, light green, green glitter, yellow glitter and red glitter. I started off with the Christmas tree for which I used the dark and light green. I started by cutting the dark green into small chunks and then squishing them back together again to get a nice malleable ball of fimo. I did the same for the light green. I then rolled them into sausages so that I had one light green sausage and one dark green. I then placed the two sausages next to each other and rolled them into one big sausage, one half light green and one half dark green. I then folded it in half and rolled it again. I folded the sausage in half once more and rolled it between my hands until it was a smooth sausage, about 7mm in diameter. I then cut slices off the sausage, 2-3mm thick, which I arranged next to each other on the chopping board. With my fingers I then pushed the edges of the discs together to ‘fuse’ the gaps. I then used the hi-ball glass (a tall smooth-sided glass) as a rolling pin. You have to turn the fimo sheet over after every few rolls or it sticks and ruins the pattern. I rolled from different directions to try and get an even thickness of fimo sheet. This also helps stop distortion of the pattern, giving a nice mosaic look. Once the sheet was between 1-0.5mm thick, I cut the Christmas tree out using the cookie cutter. I then gently lifted the shape and softly pressed it onto the glass tumbler. You have to be careful not to stretch the shape or squish it out of shape at this point. I rolled over the shape with the hi-ball glass to try and get rid of fingerprints. I then baked the glass at 130 degrees C for half an hour (30 minutes) and left it to cool. This is so that I didn’t distort the Christmas tree shape whilst adding the background. For the background I rolled together balls of red glitter, green glitter and yellow glitter. Once it was one big smooth ball I rolled it into a sausage and then folded it once and rolled it into a smooth sausage, about 1.5cm in diameter. I then cut this into discs about 2mm thick. Then I took each disc and squidged it onto the glass; this merged some of the colours and gave a very different effect to the way I did the tree. For the top of the vase I pushed the fimo right over the rim and into the interior of the vase. Once I had completely covered the vase I again ran over it with the hi-ball glass into order to smooth it and eliminate the fingerprints (you can actually sand polymer clays once they’ve been baked but I have never tried this myself yet). I then scraped around the inside of the vase with a knife blade in order to remove the excess fimo. I sign my vases and things on the bottom, using a knife or sculpting tool. Once that was done I baked it for a second time at 130 degrees C for half and hour and let it cool. I got this big box of Christmas Craft from The Works discount bookshop in Stroud. It cost me £3.99, which was reduced from about £7. It was full of coloured pom poms of various sizes, pipe cleaners in lots of colours including metallic ones, foam shapes, glitter pens, green and red lolly sticks, and ‘fashion cord’, PVA glue, plus some goggly eyes (these had red and green irises which was a bit weird). I made some examples of this that you could make out of the pack and then handed over about one and a half big craft boxes minus the glitter pens to my Scout troop to play with. The glitter pens do not dry quickly enough to be used in a Scout troop. They also had the leftovers of the Big Spooky Craft Box from Halloween. Here are what they produced! Apologies for the poor quality of the photos, I forgot the camera so had to rely on my phone to take the pictures with. He bent a star out of a silver metallic pipe cleaner, twisted a fluffy red and a fluffy white pipe cleaner together and bent it into a candy cane. For the other two were a foam cut-out Christmas tree and a yellow and gold pom pom. He tied each of these shapes to the lolly stick cross using some of the fashion cord, which was transparent plastic with sliver specks in it. I made the lolly stick cross for him out of two lolly sticks and pipe cleaners. I twisted the pipe cleaners around the middle of the two lolly sticks where I had overlapped them. One of them just stuck three pom poms together in a row, starting with a large red pom pom for the base of the snowman, then a medium white pom pom and for the head a small white pom pom. He wrapped pipe cleaners around the joins to make it look neater and stuck on some goggly eyes. He then decided he wanted to make a halo for it which he did by bending one of the metallic gold pipe cleaners into a loop. The excess pipe cleaner he used to make it ‘hover’ about the snowman’s head. Being impatient for the PVA glue to dry and seeing that I had ‘tied’ my green pom poms onto the lolly stick with pipe cleaner tinsel, one of the Scouts decided to do the same. He liked the effect so much though that he decided that the tree should just be a decoration made out of interlocking pipe cleaners giving it a surreal 70’s sci-fi egg look. One of the girls twisted red and white fluffy pipe cleaners together to get the candy cane effect and then cut the resulting twist into four. She then shaped them into little hooks. She really enjoyed doing this and so decided she would make some out of other colours as well. We had some left over stripy pipe cleaners from Halloween and she chose these to twist together. One of the girls twisted a pipe cleaner into a Christmas tree shape and then decorated it with more pipe cleaners – generally the metallic type – as tinsel. One of the boys made this surreal mobile by twisting a red and a green fluffy pipe cleaner together to produce a twist effect; he then looped this to make a circle. Then he made a lolly stick cross in the way I had shown them to and weaved the circle onto this. This gave a fantastically strong frame to work with and was very neatly done. He then made bizarre but cute little creatures from the pom poms, foam shapes and goggly eyes. He then used more pipe cleaners to attach the little creatures to the mobile. It wasn’t very Christmassy but it was really effective. This started off as a red Christmas tree because he couldn’t find three green pom poms but soon mutated into a monster. Like the Christmas trees he stuck three pom poms onto each other, large at the bottom, then medium and then a small sparkly red pom pom on the top. He used the lolly stick as a base for the moster, stuck on the yellow foam holly leaves as wings and then stuck on two goggly eyes, one green and one red, and just to make it more monster-esque, one eye is below the other rather than them being next to each other. He also used a pipe cleaner as a sort of belt for the monster. This was again incredibly simple but very cute, if not very festive. One of the girls twisted a fluffy red and green striped pipe cleaner into a flat spiral (so that it was two dimensional and didn’t go up into a cone shape. She then just simply stuck two goggly eyes into it – again one red and one green to match the stripes I assume. One of the girls made this by just sticking two red pom poms together, one slightly larger than the other, and then twisting a red fluffy pipe cleaner and a green fluffy pipe cleaner around its body (the slightly larger pom pom) as legs. She then stuck the googly eyes onto it, again one red and one green. This is a little pipe cleaner reindeer. I unfortunately thought it was a dog which she fortunately took in good grace! She twisted the body shape out of a gold pipe cleaner. She actually cut it into three pieces to get the body and ears which were little folded loops and the the two sets of legs which were just bent into two sides of a triangle. She then stuck on a small sparkly red pom pom for the face and a tiny white pom pom for the tail. She then added on the goggly eyes. One of the boys made a set of these spiral decorations. He twisted two pipe cleaners of contrasting colour together, this was a much looser twist than those used for the candy canes. He then bent the result into a loose spiralling curl with a loop at the top for attaching string so that it can be hung up. I unfortunately didn’t get a picture of this one but wished I had. One of the boys got a black pipe cleaner and then pom poms of varying sizes in white and red and cut holes through them so that he could thread them like beads onto the pipe cleaner. He managed all but the very smallest pom pom with the safety children’s scissors, the last one had to be done very carefully with the small scissors on my pen knife. He then positioned them along the pipe cleaner, the ends of which he bent so that they would loop over his ears like glasses. He then stuck a goggly eye on each pom pom and put it on so that the ‘eyeballs’ were staring out of the back of his head. It was so clever! I couldn’t stop laughing – again not very festive but a good laugh. To make this doily angel I used one paper doily (I got a packet of 74 from the £1 shop), one large white pom pom, one silver metallic pipe cleaner, two medium goggly eyes, one white fluffy pipe cleaner, one piece of red foam sheet, yellow felt, sellotape, scissors and PVA craft glue. I cut the doily in half and with one half made a cone, which I fixed with sellotape low down so that there was an opening at the top. This made the body of the angel. I then used sellotape to fix the other half of the doily on as wings. This was a bit of a mistake as I should have waited until after I had attached the halo etc. Double-sided tape would be ideal for this sort of thing but as I never have any what I do is I make a loop out of sellotape with the sticky part facing outwards – this works really well for me. For the angel’s head I took a large white pom pom and cut a slit into it using the scissors, then I squidged some PVA glue into it and pushed the white fluffy pipe cleaner into the glue filled hole. What you should do here is wait for the glue to dry before carrying on, but I cut a mouth from some red foam sheeting I had and then glued it and the eyes onto the white pom pom. I then cut out some hair from the yellow felt; this was a bit tricky and I found that adding a fringe meant the hair fitted the globe shape of the head much better. I also had to fold and glue a ‘pleat’ or flap at the back of the hair in order to make it fit. I then glued this with some difficulty onto the head. I had to use clothes pegs as ‘clamps’ to hold the hair in place whilst it dried. I think that I would have been better off making the hair out of wool or string in hindsight. I then took the silver pipe cleaner and bent it into a hoop, making sure I had about 2cm worth of spare one end, and the rest of the pipe cleaner spare at the other end so that I could twist the two ends together. I then used the long tail of pipe cleaner coming from the hoop to attach the halo to the white pipe cleaner by twisting it around. This was not very elegant but as I’d already stuck the wings on there wasn’t a lot I could do. I think it would have looked a lot better if I’d been able to attach the halo under where the wings attached at the back. I then slid the head on a pipe cleaner into the hole at the top of the angel’s body, where I discovered the head was too heavy and kept flopping forward. To solve this, I stuck the white pipe cleaner to the front of the angel’s ‘dress’ (on the inside of course!). I think the lacy bit around the edge of the doily worked really well for the wings and smock; I also think that this technique could be used to make choir boys and peace doves. I’m sure there are a miriad of other things I could make with them as well. If I had had a pink or beige pom pom I would have probably used that instead of the white pom pom, as it was just too ghostly-looking for me to be entirely happy with, but I think it’s just get-away-with-able because it’s an angel and not a choir boy. These candy canes were really easy to make and I think quite effective. I used one red fluffy pipe cleaner and one white fluffy pipe cleaner. I twisted them together to get the classical red and white striped look of a candy cane. I then cut the resulting twist into four and bent them into little hooks. I made this pom pom Father Christmas in an effort to show my scouts what Christmassy things they could make with various craft bits and pieces. I used: one large red pom pom, one slightly smaller pom pom, two small black pom poms, two small white pom poms, a tiny white pom pom and a medium white pom pom, a thick black pipe cleaner, medium thickness white pipe cleaner, one thin red pipe cleaner, a red metallic sparkly pipe cleaner and two self adhesive googly eyes. I also used PVA craft glue and a pair of scissors (as I chop the pipe cleaners with them, the scissors need to be sturdy and not be good dress-making scissors, as it will blunt them). For his body I stuck the large red pom pom and the slightly smaller red pom pom together> I then stuck the medium white pom pom onto the slightly smaller red one as his head. I then made the mistake of gluing his arms on around the waistline (ie where the large red pompom and the slightly smaller one met). I stuck the two goggly eyes onto the face and then cut a small 5mm length of the thin red pipe cleaner and curved it into a smile shape and stuck that onto Santa’s face. I left the whole lot to dry for a while. I then decided that he needed a black belt, so I cut a 10cm length of the thick black pipe cleaner and stuck it on around the join between the two red pompoms. This was when I discovered it had been a mistake to glue to hands on, as the belt needed to go underneath them. I had to thread it through and as a result, I don’t feel it was as neat as it could have been. That done, I thought that he was still missing something vital so cut a short piece of white pipe cleaner (approximatly 2.5cm) and stuck that down the centre of his chest as fur trimming of his coat. For Santa’s hat I cut a third off a red sparkly pipe cleaner and twisted it into a conical spiral (a spiral that gets smaller as it goes up). I then cut a small hole in the tiny white pom pom, which I filled with PVA glue and stuck the end of the pipe cleaner in. I then left it to dry for a while. I then glued the hat on Santa’s head. He looked almost right but he needed boots, so I glued on the two small black pom poms as feet. I think this would have worked better with a larger range of pom poms, such as pink ones for the face and hands, meaning that I could have done white trimming on the hat and ‘sleeves’ of the coat.